UNEQUI Ltd (Science & Creativity) is dedicated to improve the lifes and welfare of animals and humans through scientific research, knowledge dissemination, innovative thinking, solution storming and creative enhancement of all our environments. I was born in Austria and grew up there, loving nature and always in awe of horses and animals in general both from an artistic angle but also being passionate about the subject of Biology. 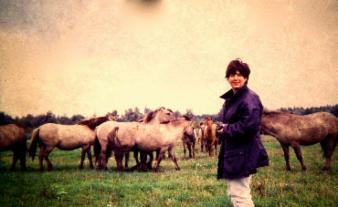 I studied both arts subjects, horsemanship (BHS), book-keeping and business studies and later did a degree in Equine Science, followed by a PhD ( Applied Biology: Comparative Animal Physiology) focusing on food intake behaviour and digestive processes in horses and sheep at Writtle College, Essex University. After this I worked as a Scientific Researcher at the Research Institute for Applied Husbandry, Wageningen University Research, The Netherlands, for four years. At this point I gained a huge amount of experience through project managing a vast array of studies in Equine Science from nutrition to behaviour to welfare to reproduction and exercise physiology. I also did guest lectures at Dutch and English Colleges/Universities and became more active within scientific focus groups. From 2004-2012 I worked at Nottingham Trent University as Senior Lecturer, where I led the design of the MSc in Equine Health and Welfare and then was Programme Leader for this course. I was also Ethics Representative for the School of Animal Rural and Environmental Sciences within NTU. I have continued to be active in national and international equine science and education focus groups, was Chair of the Equine Science Education Working Group of the European Association of Animal Production (EAAP) until 2012 and Co-chaired the European Workshop on Equine Nutrition, held in the UK, Cirencester, 2012. I am passionate about good science teaching and research and I was very privileged to be External Examiner for the Equine Science Masters Courses at the Royal Agricultural University and at Edinburgh University. I am also a member of the Society of Biology and I am Assessor for their Degree Accreditation Programme. See my Linked In profile for my current engagements. UNEQUI LTD has both a scientific but also a creative 'arm' - I don't think science and art are that far apart at all. Albert Einstein said: The intuitive mind is a sacred gift and the rational mind is a faithful servant. We have created a society that honors the servant and has forgotten the gift! In the past 20 years I have had the privilege to meet and work with some of the most renowned scientists in Equine and Animal Science - so if I do not have the answers for you I may be able to point you towards the right person. Please ask!